The purpose of this project is to identify strategies that will reduce congestion for trucks traveling within and through the Twin Cities. The planning and development of most highway facilities focuses on the general needs of the majority of traffic in the traffic stream. However, the performance, function, and purpose of heavy trucks are dissimilar to those of the majority of the vehicles in the traffic stream. It is for this reason that the National Cooperative Highway Research synthesis report 314 identified a number of improvements that state transportation agencies have implemented, or are planning to implement, that focus on the unique needs of trucks to better accommodate truck-borne freight traffic. 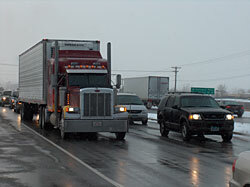 Additionally, to help reduce delays and congestion a number of urban areas have conducted studies of the unique issues trucks face. The study first identified an exhaustive list of potentially feasible strategies and then through iterative steps narrowed these down to the most promising. Five strategies were ultimately selected. The report focuses on issues related to the five strategies and their implementation.